"These brownies are mouth-wateringly rich and combine two of the most delicious flavors in the world - chocolate and peanut butter!" I just used a box of brownie mix and swirled the PB on top. They came out fudgy and delicious. 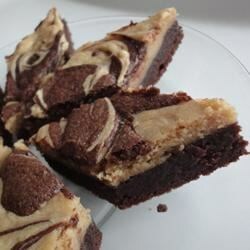 if you love peanut buttery goodness, this recipes is for you! REALLY good brownies. I used 1 cup of peanut butter. Also put in an additional 1/4 cup of flour and cut back the butter by 1/4 stick. They were perfect!